I decided to focus on some upcoming 2015 titles for this week's topic. Obviously I don't own any of these yet, but definitely want to read them! 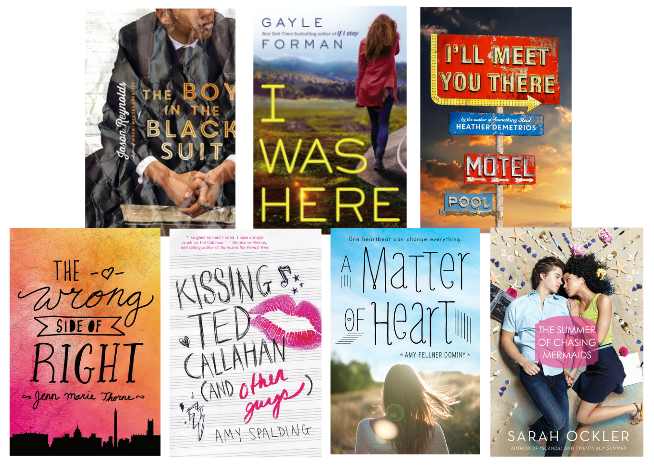 How about you, any of these on your TBR list for 2015? In case you want to browse more, I've created my own 2015 to-read shelf on goodreads. Feel free to check it out & build your own forever growing TBR list :) As always, be sure to check out The Broke and the Bookish for more details on this awesome weekly feature. Oh wow, I have to look up some of these for sure! Oh my, yes to all of these! Looks like 2015 will be another good year for contemporary. Forman! Kirby! Han! Sales! Spalding! And thanks for putting the new Jason Reynolds on my radar- can't wait! I think I see a theme here (YA contemporary!). I hadn't heard of most of these, but they do look lovely. Nice list! I'm looking forward to I Was Here so much. I actually tried to request an ARC for it but was denied. Gayle Forman's one of my favorite authors. I haven't heard much about the rest of these, but I'm definitely adding them to my TBR - they all look so good! I haven't heard of most of these, in fact I haven't even THOUGHT about my 2015 reads yet, I still have so many backlist reads I'm looking forward to. Going to go check out your GRs list though and see what I fancy adding to my pile!! All those covers are just so adorable! I'm especially excited for I'll Meet You There (hopefully every bit as good as Something Real), I Was Here, and The Summer of Chasing Mermaids.